Four Seasons Health Care is an independent healthcare provider of nursing homes, care homes and specialist units throughout the UK. Recently, Four Seasons built a new care home in Battersea and Chieftain Fabrics were the Number one Choice for contract fabrics. 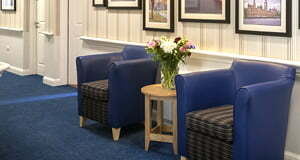 The Reception pic shows our Chieftain Legend Navy in use and the dining room shows Chieftain Jazzberry in use on the chairs.